Lover’s Key Sate Park’s beach is filled with seashells. Here my two guys are wading in the water looking for some good ones. Photo: Dee Rico Photography. All Rights Reserved. Located between Fort Myers Beach and Bonita Beach The Lover’s Key Carl E. Johnson State Park is made up of four barrier islands, Lovers’ Key, Black Island, Inner and Long Key along with several islets. One the top three most visited parks in Florida Lover’s Key has something for everyone from beautiful beaches and nature trails to kayaking and fishing. 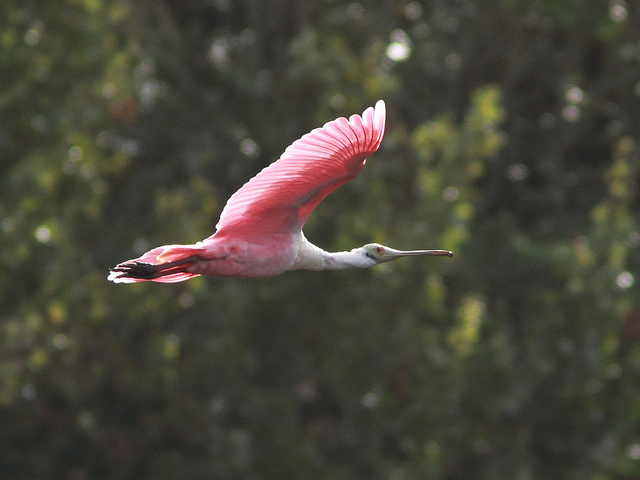 The park is a natural preserve filled with wildlife and it is home to manatees, bottlenose dolphins, roseate spoonbills, ospreys and bald eagles in addition to thousands of migratory wading birds, shorebirds and other waterfowl in season. Black Island has more than five miles of nature trails, ideal for hiking, biking or walking. Our family looking for manatees on the bridge that takes you to the beach. . Photo: Dee Rico Photography. All Rights Reserved. A gorgeous white-sand beach stretches for 2 ½ miles and is popular for swimming, shelling and sunbathing. We take the kids and have a picnic on the beach and enjoy watching countless wading birds and the occasional bottlenose dolphin or manatee. A courtesy tram is available to the south beach where a gazebo, restroom and picnic area are located you can also take a short walk over two bridges to reach the mid portion of the beach, which is left natural, with no facilities. On the park’s bay side, across the road from the beach entrance there is an area with playgrounds and a picnic area. Lover’s Key is also a favorite place for fishing. Angles and boaters can launch their vessels from the park’s boat ramp. The park’s concession offers kayak tours, as well as bicycle, canoe and kayak rentals or you sign up for a free excursion to learn fishing and nature photography. You can find out what is going on at Lover’s Key on the Friends of Lover’s Key website where volunteers organize everything from kayak excursions and wading trips to 5K races and nature talks. The beach can get crowded on weekends and in season specially close to where the tram leaves you or close to the where you reach it by bridge. On weekdays, and even early in the morning on weekends you will pretty much have the beach all to yourself and it will be easier to find great shells and observe wading birds. We have seen dolphins quite a few times and sometimes really close to the beach as well as great blue herons and lots of pelicans and alcatraz and it’s always easier to see them in the morning. 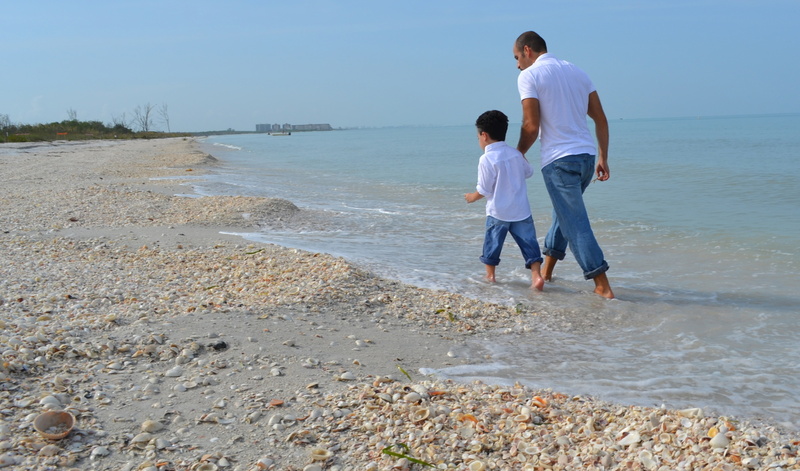 The beach is sometimes completely covered with seashells, specially near the water. This is wonderful for shelling but not that great for bare feet. We always bring water shoes for the kids so they can get in and out of the water without hurting their feet on the shells when they are coming out and I would not recommend taking a long walk on the beach barefoot so you’d better bring some beach shoes you can get wet. Since this is a natural preserves the mosquitoes and noseeums can get really bad specially in the trails and if you are away from the shoreline. Check the weather to see if it’s mosquito season and don’t forget to bring your bug spray. A great find while shelling on the beach at Lover’s Key. Photo: Dee Rico Photography. All rights reserved. Visit the Lover’s Key State Park website for more information, tour reservations and rentals of bicycles, canoes and kayaks. What a beautiful beach! I’ve never heard of it but I would love to check it out! We live on the SW coast of Florida and like the beaches here, but we really love the beaches over on your side and try to visit as often as we can! I’ve never been to Key State Park , but that sounds and looks wonderful. It is very cheap! Every time I come to this site, I long to return to Florida! 🙂 It is such an amazing state, and I love vacationing there!